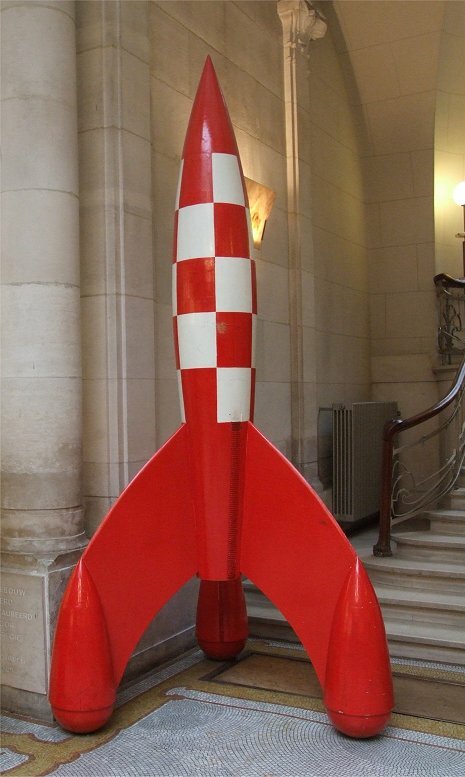 My long weekend in Brussels is now all but done. I had vastly underestimated the number of museums in the city and we only managed to see a fraction but this was still quite sufficient to induce information overload after three days. 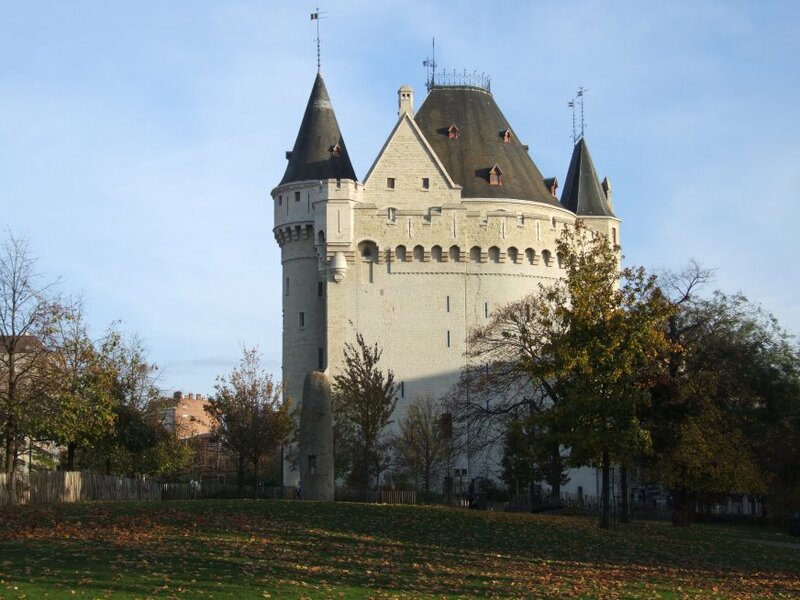 Our trip had taken in the archaeological site of the Coudenberg Palace, BelVUE, the comic strip museum, the Magritte museum, the museum of musical instruments, the Halleport and the museum in the Maison du Roi. 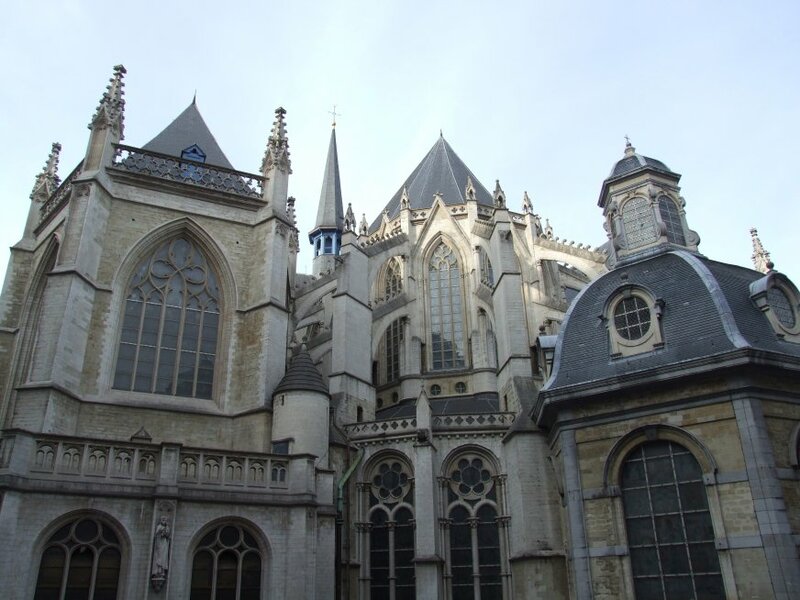 Added to this, we stumbled across a number of monuments and historic buildings that we hadn’t planned to see but couldn’t ignore. 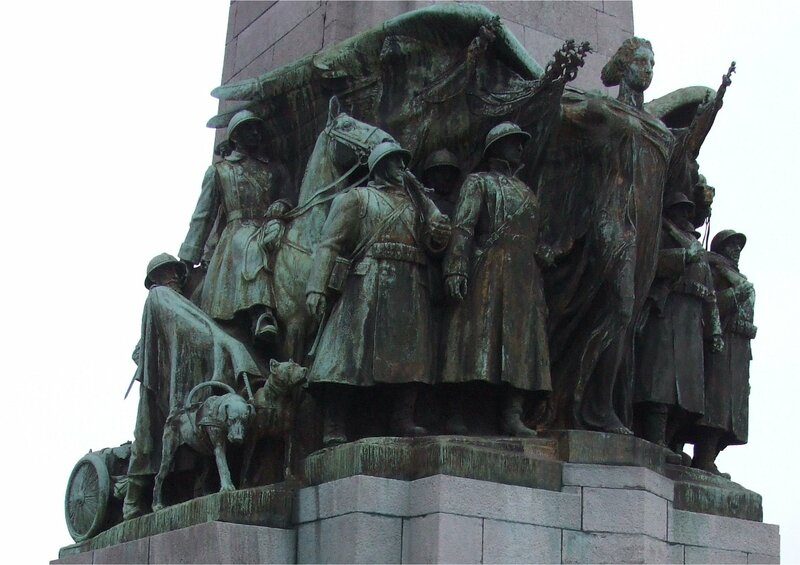 The Anglo-Belgian Memorial was one of these – a sight instantly recognisable as the work of Charles Sargeant Jagger and as striking as the other monuments that he designed (such as the GWR war memorial at Paddington, the British Memorial at Nieuwpoort and the Royal Artillery Memorial at Hyde Park Corner). 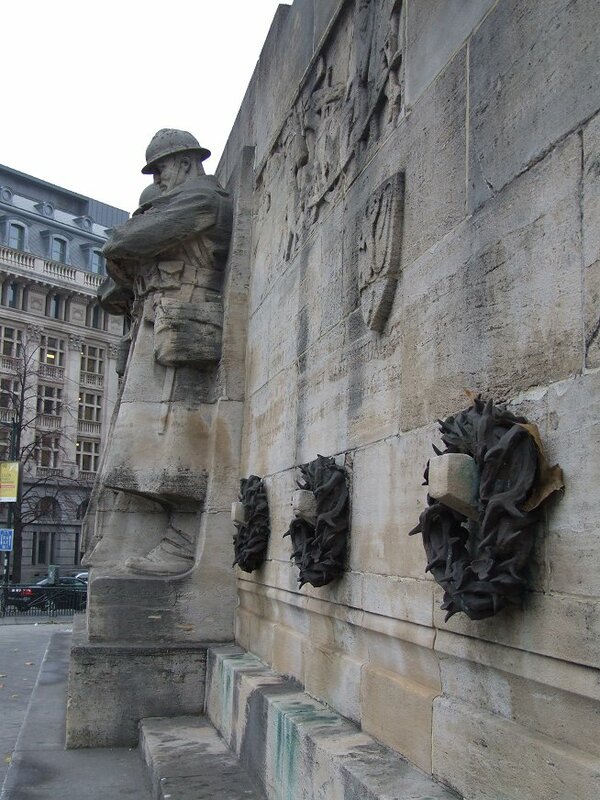 The monument stands in recognition of the support given by the Belgians to British Prisoners of War during the First World War. The nearby monument to the Belgian Infantry outside the Palace of Justice was also quite stunning, though none of the photographs I took in the miserable weather really captured this. If I had to pick a favourite museum it would be tough. 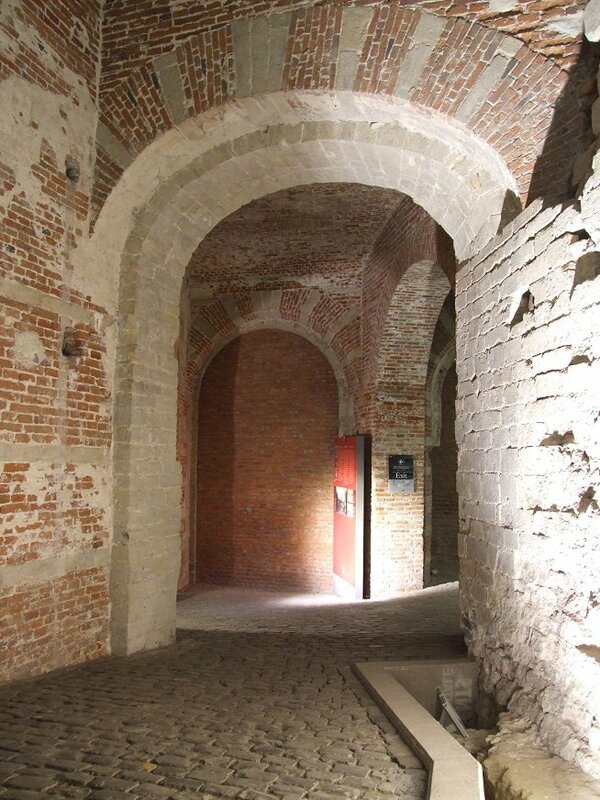 I particularly enjoyed walking around the archaeological site of the Coudenberg Palace as we had the place to ourselves and it was amazing to see the extent of the cellars and sealed off streets that were hidden away beneath the Place Royale. 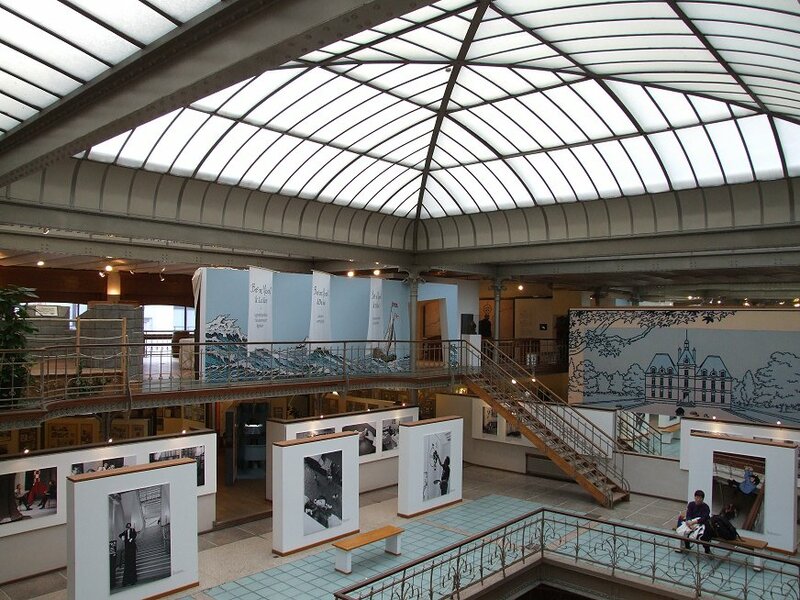 I also loved the art nouveau interior of the Centre Belge de la Bande Dessinée (Belgian comic strip centre) which was incredibly once just a warehouse. 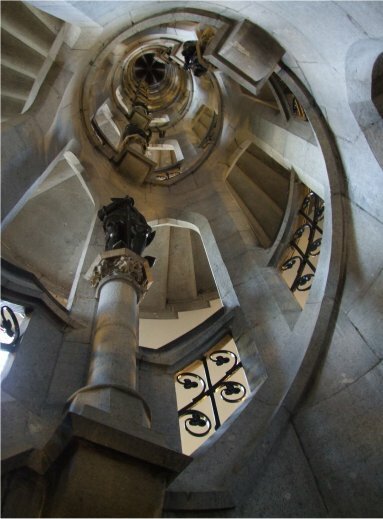 I think it is one of those rare occasions where a building’s new use is actually a better showcase for its splendour than the original purpose. It wasn’t much of a gastronomic adventure, but I would have to recommend the Horta Brasserie at the Belgian Comic Strip Centre for a tasty lunch and great beer in an amazing setting. Anyway, all of that is now behind me… a swift return journey on the Eurostar should get me back into London in time for a sunday roast and a return to reality. 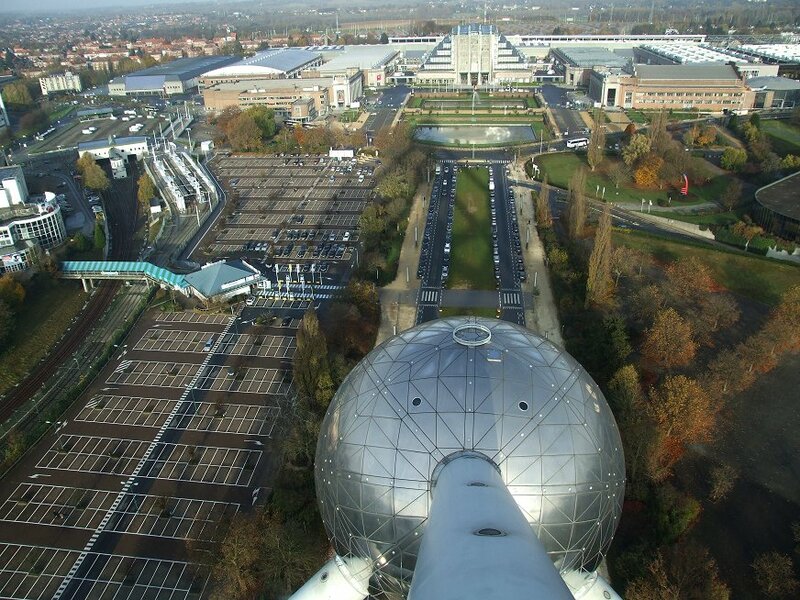 The atomium has fascinated me ever since I saw some pictures of it as a child, so first thing this morning we took the metro out to Heysel to get a better look. 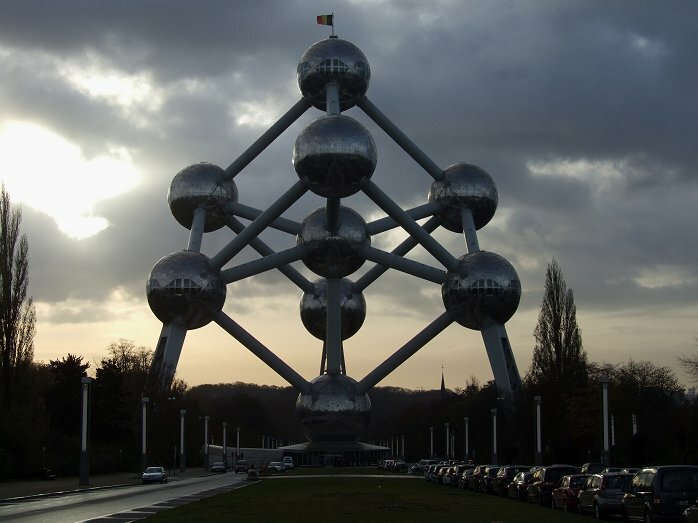 It must all have seemed incredibly futuristic when it was built as the centrepiece of Expo 58 and it is remarkable that it retains that wow factor to this day. It manages to be even more impressive as you draw closer and begin to appreciate the scale of the structure from underneath. 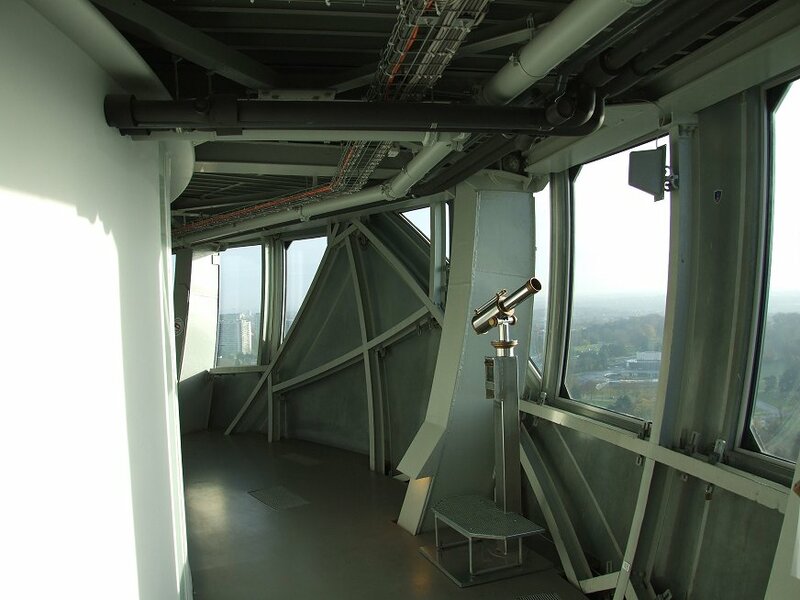 I was among a small group of early arrivals who took the lift up to the panoramic pod for a view out over the exhibition grounds and nearby stadium, which keeps you entertained for five minutes before you head back down to visit the remaining pods. 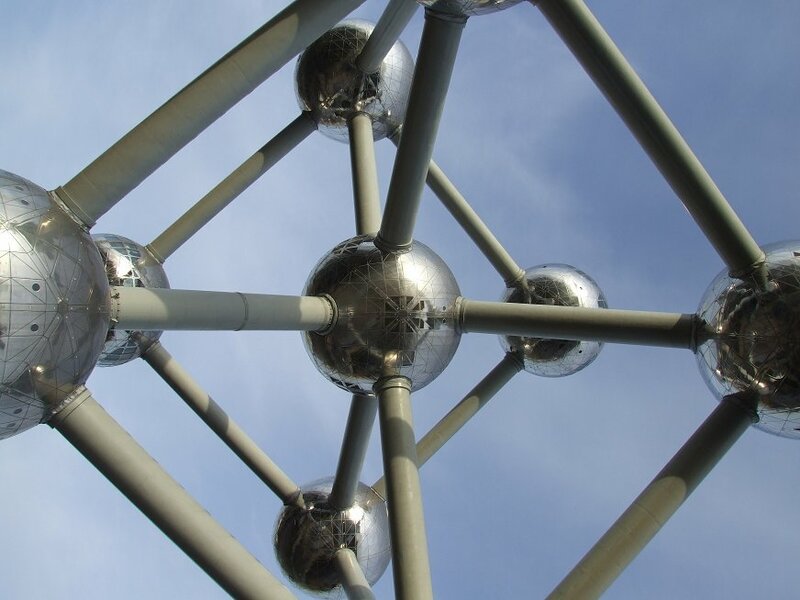 In all honesty the remaining displays in the atomium are not terribly impressive – a rather lacklustre display about Expo 58 and a very dull temporary exhibition about immigration. Maybe it is always going to be impossible to live up to that exterior view, but it rather feels like they are not even trying. 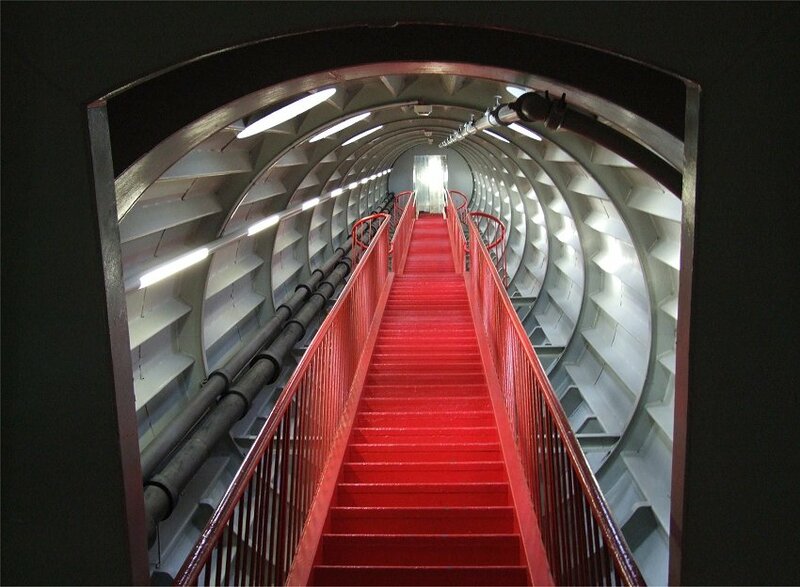 Don’t get me wrong – it was still fascinating to explore the interior using a combination of stairs, escalators and lifts (which have a glass roof that allows you to see all the way up to the top) but I just wish that it left you a little more inspired. 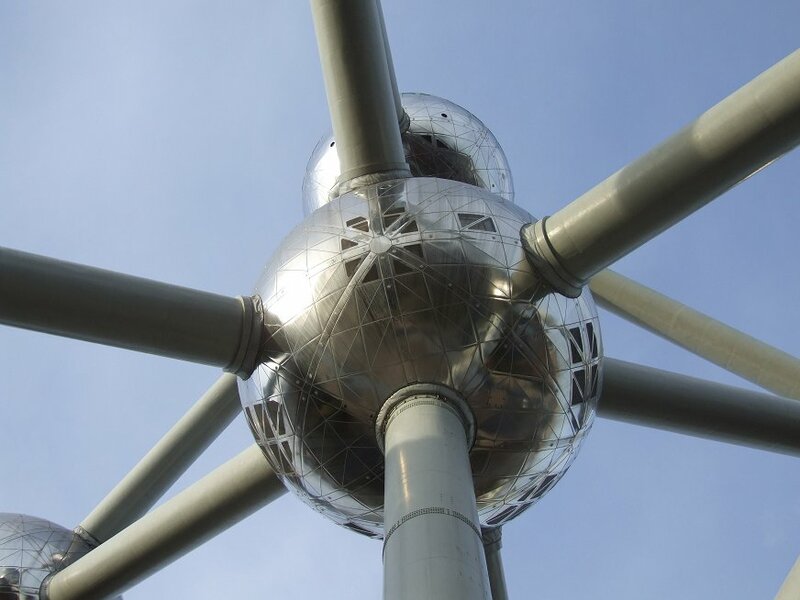 I have long intended to spend a weekend in Brussels after catching a fleeting glimpse of the city at night years ago, but in the end it has taken me sixteen years to make the trip back. 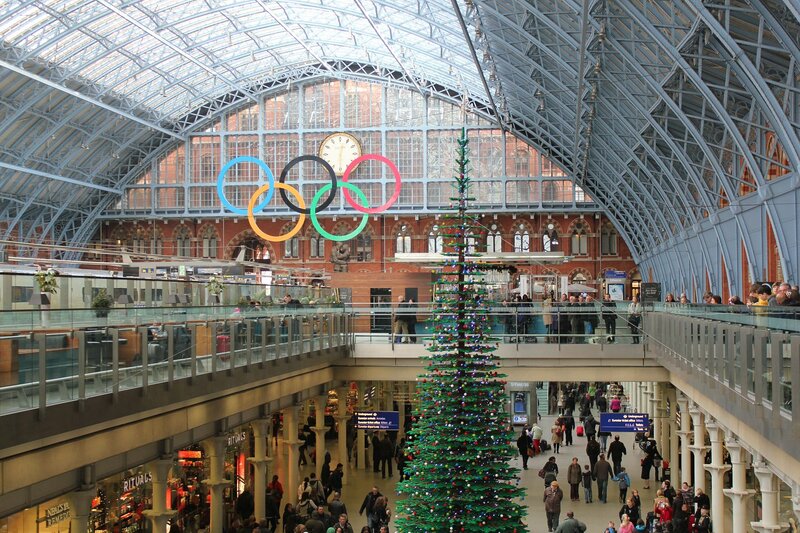 It is also my first opportunity to take the Eurostar from St Pancras. All my previous trips on Eurostar had been from Waterloo International and as convenient as that was for a south londoner it’s impossible to deny the vast improvement in departure lounge facilities that the move north has brought about. I had feared that I wouldn’t reach St Pancras in time after getting to my local station to find announcements about a ‘major signal failure at London Bridge’ but luck was on my side today. I somehow still managed to be early, so had a chance to wander round and admire the freshly installed lego christmas tree. 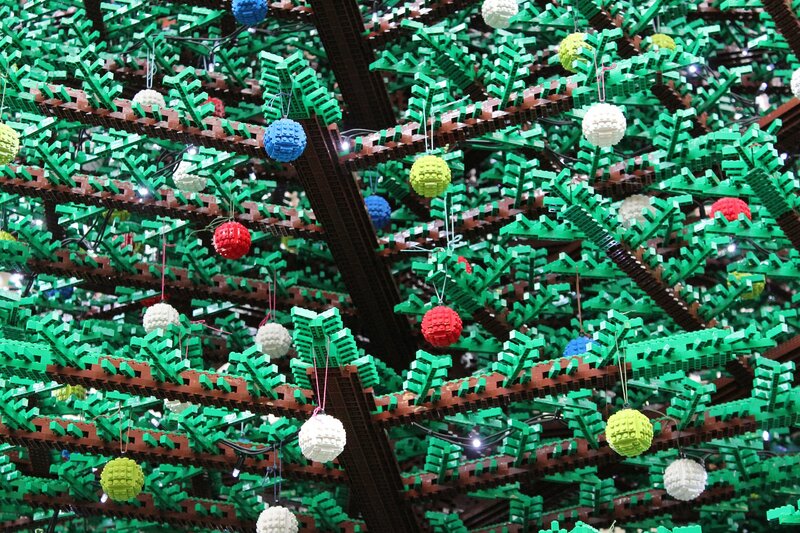 As something of a lego-addict as a kid it was hard to resist a smile at seeing the towering tree which has been made from 600,000 lego bricks (with 172 branches and 1200 baubles also made from lego). 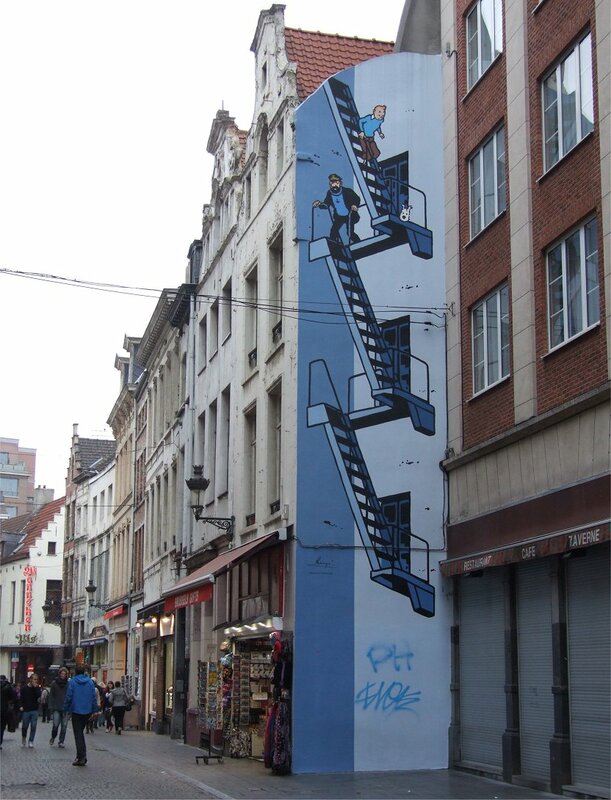 It seemed somehow appropriate that after leaving St Pancras and it’s lego christmas tree behind the first sight we saw in Brussels was a giant mural of Tintin clinging onto a steam locomotive at Brussels Midi. 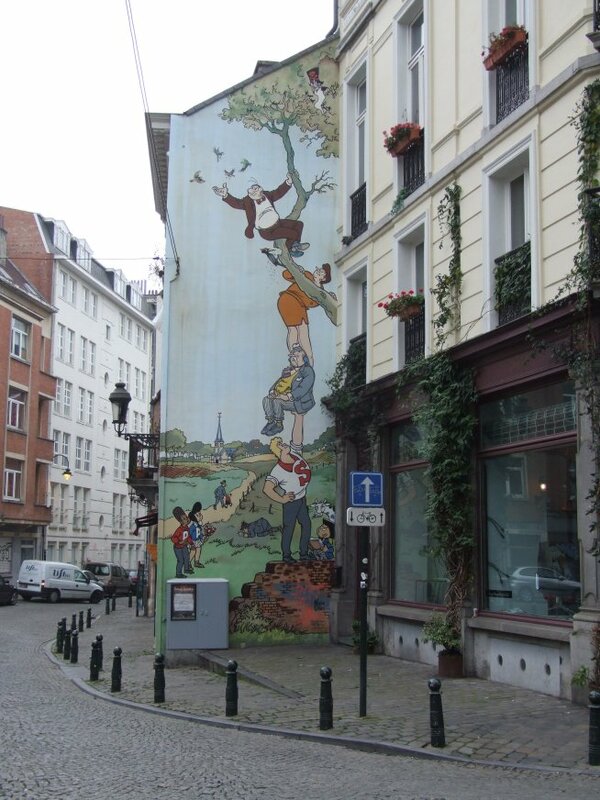 In fact, this mural set the theme for the day. As we had arrived too early to check in we used the comic strip walk as a useful way to wander around the city centre and get our bearings before heading to our hotel. 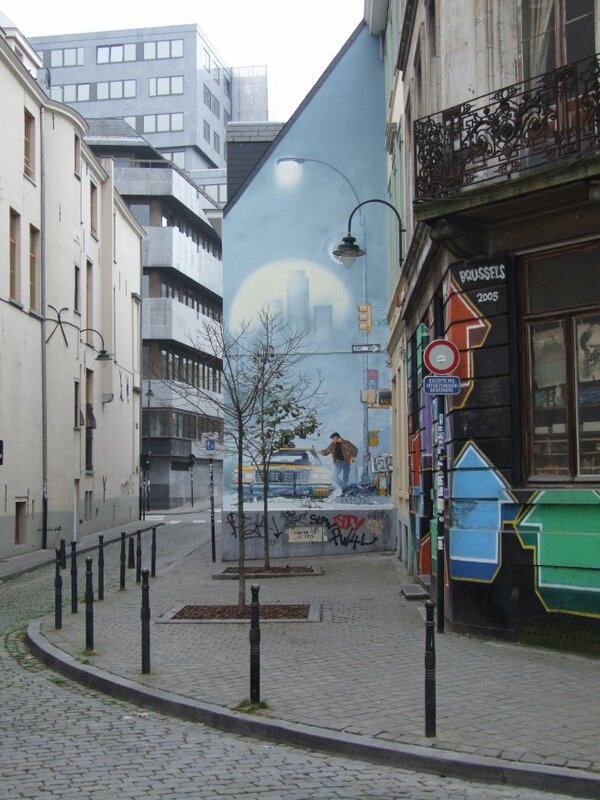 The trail is marked out on a map (available from the tiny tourist information office at the station for 0.50 euros) and it was remarkably good fun to follow the route without knowing which mural we would see and quite where in each street we would find it. 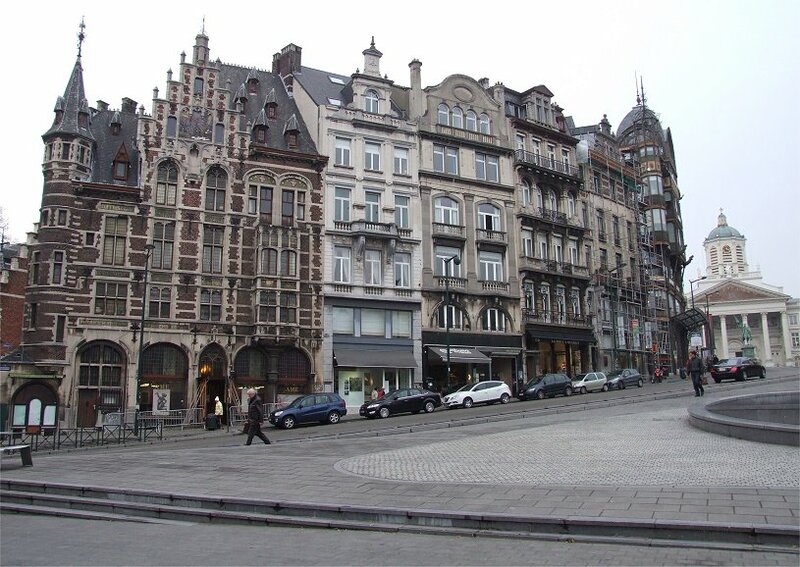 The preparations for christmas were well under way with market stalls being installed across the city centre and rehearsals taking place for the first of the electrabel nights (a rather wonderful sound and light show played out across the Grand Place). It was a challenge to wander round the city without stumbling across a chocolate shop every few yards but thankfully the prices were sufficiently high to help me resist temptation!